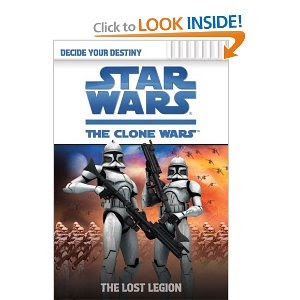 Mikey, one of my sixth grade students offered me the opportunity to read one of his favorite books, The Clone WArs. He was so enthusiasticd about them because they had alternate endings. I'd only read one other book like this and it had been when my son was in fourth grade. That was about fourteen or fifteen years ago. Mikey proceeded to take me through thebook and tell me which endings would end up bad and why I might want to make a different choice. I am glad he shared it with me. It was a fun book and to see the enthusiasm in his eyse was worth it. When I returned the book to him I told him that I would not have made a very good leader as I was given that choice from the test I took at the beginning of the book. It seems no matter how many times I read the book and made different choices, somewhere along the road I got myself or my men captured or worse. I can understand why these books keep kids reading. I would definitely recommend this type of book to my students. I would like to publicly thank him for enthusiastically encouraging me to read his book. Mrs.Stiles did you know there is also another good book called "Death Troopers"? Its at the public library somewhere in the Young Adult section I think. Aside from Death Troopers, theres also the book Darth Bane Path of Destruction which is really good.